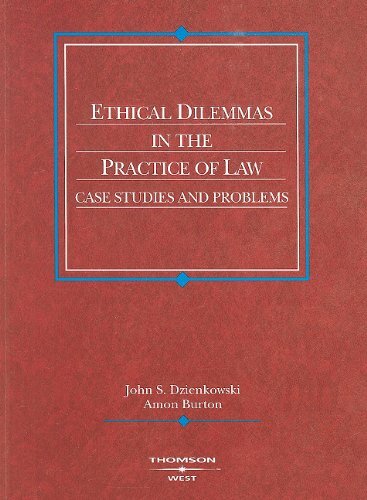 This book of case studies and problems brings real ethical dilemmas in legal practice to life by raising ethical issues and dilemmas in the context of actual fact patterns. These case studies are created from actual ethical problems that have arisen in malpractice cases, state bar grievances, motions to disqualify counsel, or other claims against lawyers. The materials have been developed and tested in the classroom for over a decade. The text uses twelve short case studies to present material in the topics of attorney client relationships, confidentiality, conflicts of interests, candor to the court, and attorney-client fee agreements. Each case study contains a short statement of the facts and is followed by different types of source materials, such as motions, depositions, affidavits, emails, and engagement letters. The case studies also include a selection of relevant legal authorities such as court opinions, ethics rules and opinions, rules of evidence, and rules of procedure. Throughout the material, the students are presented with questions to consider as they would do in the practice of law. If you have any questions about this product by West Group, contact us by completing and submitting the form below. If you are looking for a specif part number, please include it with your message.